One of the first wildflowers to bloom each year, the fragile bloodroot appears well before trees leaf out. 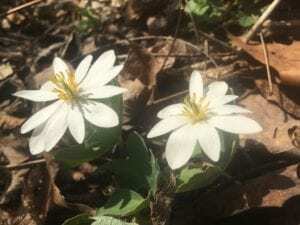 Native Americans used bloodroot as dye for baskets and clothing, as well as for body paint. In large quantities, the orangish-red juice found in its rhizome is poisonous and can be lethal. These flowers appeared near the creek bank at Up the Creek RV Camp but can also be seen on Porters Creek Trail or Rich Mountain Road in the Great Smoky Mountains National Park.